Not to be confused with Saint Laurent (film). Yves Saint Laurent is a 2014 French biographical drama film directed by Jalil Lespert and co-written with Jacques Fieschi, Jérémie Guez and Marie-Pierre Huster. The film is based on the life of Yves Saint Laurent from 1958. The film stars Pierre Niney, Guillaume Gallienne, Charlotte Le Bon, Laura Smet, Marie de Villepin, Xavier Lafitte and Nikolai Kinski. The film opened the Panorama Special section of the 64th Berlin International Film Festival at the renovated Zoo Palast, with director, cast and Pierre Bergé in attendance. The film received seven nominations at the 40th César Awards, winning Best Actor for Pierre Niney. In March 2013, The Weinstein Company acquired the rights to the film to distribute in the United States, while Entertainment One holds U.K., Australian and Benelux distribution rights, including Canadian distribution rights. Director Jalil Lespert and lead actor Pierre Niney at the film's premiere in Paris. Principal photography began in June 2013. Part of the filming was done with Bergé, who sent "out models on the runway for a reconstitution of Saint Laurent's famous Opéra Ballets Russes collection of 1976, which was filmed at the fashions show's original venue, the Westin hotel (formerly known as the InterContinental.)" Bergé's foundation loaned the film "77 vintage outfits from its archives and allowed Lespert to film certain scenes at its headquarters on Avenue Marceau in Paris." Bergé "praised Lespert's film—based largely on a Laurence Benaïm biography of Saint Laurent and Bergé's reminiscences in his book Letters to Yves—for showing the designer's demons." Bergé said "...there are details I don't like, but that is of no importance whatsoever. You have to take the movie as it is—as a whole." Yves Saint Laurent received mixed reviews. On film aggregation website Rotten Tomatoes, it holds a rating of 45%, with an average score of 5.3/10, based on reviews from 65 critics. The site's consensus reads "While it boasts its share of fine performances, Yves Saint Laurent is also disappointingly bland and formulaic — especially given its subject's dazzling reputation." On another website, Metacritic, it has a score of 51/100 (indicating "mixed or average"), based on reviews from 25 critics. Guy Lodge from Variety stated in 2014, "considerably less innovative than its human subject", "disappointingly by-the-numbers treatment" and "awkwardly structured". ^ Yanbékian, Annie (13 August 2013). "Ibrahim Maalouf écrit la musique du film de Jalil Lespert sur Saint Laurent". Culturebox (in French). Retrieved 10 April 2014. ^ "Yves Saint Laurent". British Board of Film Classification. Retrieved 23 October 2017. ^ a b JP. 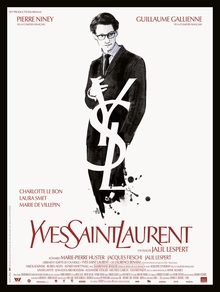 "Yves Saint Laurent (2014)- JPBox-Office". www.jpbox-office.com. Retrieved 23 October 2017. ^ a b c d Diderich, Joelle (10 January 2014). "Yves Saint Laurent Biopic Wins Pierre Bergé's Approval". WWD. Retrieved 10 January 2014. ^ "Panorama 2014: First Films". berlinale. Retrieved 31 December 2013. ^ "Yves Saint Laurent". berlinale. Retrieved 7 February 2014. ^ "Juliette Binoche, Marion Cotillard, Kristen Stewart Among France's Cesar Awards Nominees". The Hollywood Reporter. Retrieved 31 January 2015. ^ "TWC Takes U.S. Rights to Yves Saint Laurent Biopic". variety.com. 19 March 2013. Retrieved 25 July 2013. ^ "Yves Saint Laurent (2014)". Rotten Tomatoes. Retrieved 22 August 2014. ^ "Yves Saint Laurent". Metacritic. Retrieved 22 August 2014. ^ Lodge, Guy (10 February 2014). "Berlin Film Review: 'Yves Saint Laurent'". Variety. Retrieved 14 February 2019.